Brit West was established in 1990 and over the past 25 years has become known for providing quality, age-appropriate coaching in a fun and sporting environment. Smaller coaching groups allow for more individual attention and better results. Camp fee includes a soccer jersey and skills card. 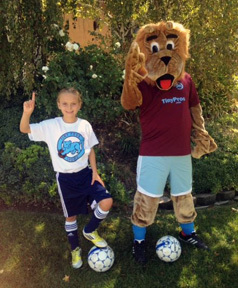 Let Brit West take your young soccer player to the next level this summer. The Full-Day Camp for ages 6-14 develops individual skills through a warm up, agility and speed, skill of the day (technical training), fun games, and coaching in small-sided games to put acquired technique into the game situation. Kids will learn “street games,” position (functional) training, and more tactical practice in game situations. Friday is World Cup Day; teams wear their colors to compete and are grouped according to age and experience. Full Day campers will spend one hour cooling off in West’s 3- to 4-foot deep indoor pool. Soccer Water aerobics will be followed by free swim. Please read: SPECIAL CANCELLATION POLICY; SIGNED RELEASE REQUIRED. To access the release form, copy & paste this URL into your browser: tinyurl.com/minorsrelease. CAMP CANCELLATION POLICY requires you to cancel AT LEAST TWO WEEKS before camp begins in order to receive a refund, credit, or transfer. Camp refunds, credits, and transfers are subject to a $25 processing fee.